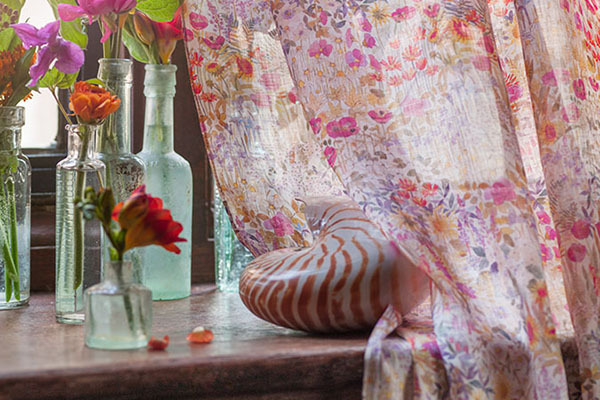 Floral Clay voile in Sunrise by Liberty Art Fabrics (Interiors). Choose your entire interior scheme in our calm and creative sample rooms. We have over 1500 books from leading fabric houses and designers and the latest collections for high quality brands including Mulberry, Designers Guild, Osborne & Little, Colefax & Fowler, Sanderson, Romo and Jab. Tassels, trimmings and tie backs to match your décor and to finish your upholstery. Find exquisite wallcoverings to order for contract, heavy duty or general use and complementary paint selectors from Mylands, who offer a bespoke colour matching service in addition to their ‘Colours of London’ collection. They will match any piece of fabric or wallpaper for you. We also offer selectors from Little Greene, the chosen partner for the English Heritage range of colours covering the key periods of interior design from the Georgian era to the 1950s. We can supply sheer voiles, blackout fabrics, linings, venetian blinds, roman blinds, pelmets, curtain poles, finials, track and tape to transform and create a fabulous frame for your windows. We will measure, make, deliver and hang your new drapery, please make an appointment for a consultation. Click here for a selection of the brands and fabric sample books in store at E & A Wates. Our dedicated team is available to guide you through the fabric sample rooms, please call us if you would like to make an appointment or drop in and browse at your leisure. Our resources are extensive so please allow plenty of time for your visit and bring your photos with you. If you want greater input then please ask about our Interior Design Service. We can plan a complete room or whole house. A designer will visit you at home, discuss your ideas, measure, plan and with your involvement, create an innovative design proposal. When you have narrowed down your choices we can order samples of furnishing fabric, wallpaper and carpet and they will be sent direct to you. If you bring in photographs of your project and rough measurements we can estimate how much fabric is required. When you have made your final choice an adviser will call round and measure up. We can arrange specialist fitters to install your curtains, cushions, loose covers, blinds and carpet.